The perfect balance between design and performance, the Manfrotto Pro Video Head puts you in control. The perfect mix of stability, strength and speed to suit any condition. The tripod video head is made entirely from lightweight and durable aluminium, so you can take it anywhere while knowing that it’s built to last. 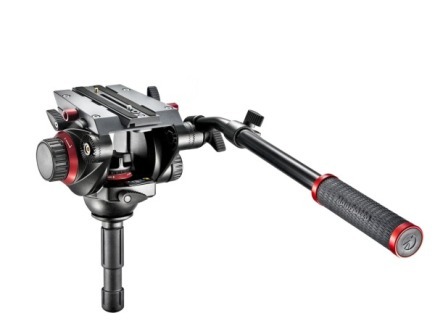 When you’re setting up a shot, the Manfrotto Pro Video Head offers unrivalled stability. Pan movements are vibration-free, with an axis rotation unit utilising ball bearings for incredible smoothness. Levelling is simple thanks to the 75mm diameter hemisphere and backlit bubble level. The Fluid Drag System provides variable friction for unparalleled precision. Plus, a 4-step counterbalance system offers optimal security for your equipment. A load capacity of 7.5kg makes the Manfrotto Pro Video Head suitable for a vast variety of cameras. FDS on both the pan and tilt axes lets you work perfectly at all temperatures, with all equipment types. Setup is simple and quick, with ergonomic controls and easy-link connections for your accessories. Center of Gravity: 55mm / 2.17"
Working Height: 15.5cm / 6.1"